Economic values (EVs) are an estimate of the value of a trait to a NZ dairy farmer. These values are combined with Breeding Values to calculate an animal’s Breeding Worth. In February 2019, the Economic Values used to calculate Breeding Worth, Production Worth and Lactation Worth will be updated. This web page describes the expected changes to BW. Breeding Worth is the industry index which ranks cows and bulls on their ability to breed profitable and efficient replacement dairy heifers. How economic values (EVs) are calculated and why they change. EV’s represent the value of different traits to New Zealand dairy farmers. The economic values are applied on a ‘profit per unit’ basis. For example, one additional kg of protein creates $6 of additional profit for a dairy farmer. Economic values are updated every year to reflect changes in these values, ensuring Breeding Worth remains relevant in an ever changing market environment. Effective emphasis on the individual traits within Breeding Worth. Why are Jerseys ranking so much higher than Friesians? Jerseys typically have the highest ratio of fat to protein in their milk and this means that a kilogram of milk solids from a Jersey cow will, on average, be worth more to a farmer than a kilogram of milk solids from a Friesian cow. The calculation used to set the weightings on fat and protein in BW 2019 is made using a Valued Component Ratio (VCR) of 1.01 (i.e. fat is worth 101% of the value of protein). This is made up of a five-year average which includes one forecast year. In future, Jerseys are likely to continue to rise as the value of fat remains strong and low VCR years will drop out of the average for the next few years. Can I still rely on BW if I prefer Friesian cows? Yes, in New Zealand, we have a unique opportunity to respond to a high value for milk fat, regardless of cow breed. This is due to high genetic variation in fat production across major breeds. Breeding Worth (BW) can help you identify sires and cows whose progeny have the strongest ratio of fat to protein across all breeds. What is the Fat Evaluation Index (FEI) and will it penalize high fat herds? The FEI grading system was introduced by Fonterra in 2018. The main driver of the FEI is the amount of PKE fed and the PKE fat content. High fat herds will not be penalized. The FEI is a score given to individual herds, based on the composition of the milk fat produced, rather than the amount. It is designed to make sure New Zealand’s milk fat is suitable for manufacturing products that meet customer specifications. This index was designed to indicate the suitability of the milk fat composition for processing into a variety of products. A high fat herd and a low fat herd can have the same FEI, providing the composition of the fat is the same. The FEI is altered by diet, for example, a herd that is fed a large quantity of palm kernel extract (PKE), will have a higher FEI than a herd that is predominantly grass fed. Further information on PKE is available here. The high value of fat might be a passing fad. Could we be jeopardizing progress in other important traits by responding so aggressively. The value of milk fat has been climbing for several seasons. The VCR was 0.43 in in the 2014-15 season and has risen consistently since then. BW 2019 is conservative when compared to the current market. 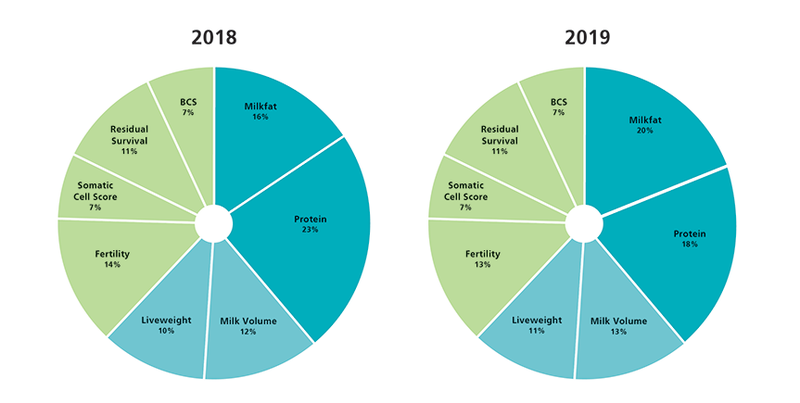 The VCR used in the BW 2019 calculations is 1.01 while the latest Fonterra VCR has milk fat at 130% of the value of milk protein (e.g. a VCR of 1.30). As a farmer, what should I do? Check with your breeding company to learn how they are responding to this change. If you know the bulls on your team, you can look at DairyNZ’s bull team builder tool to search for any AE-enrolled sire and see his BW 2019 figure. Check it out here. The table below shows the new economic values. Economic values are calculated assuming industry averages for animal production, feed requirements and farm systems. The following table is a list of the key averages which are incorporated into the Economic value calculations. The BW of high fat sires will increase, and conversely the BW of high protein sires will decrease. For bulls born after 1999 with a BW Reliability of 75% and a BW 2018 of >0, Friesian bulls are the most affected, with an average shift of -$27.7. Jersey, Cross-Bred and Ayrshire bulls have shifts of $23.3, -$4.8 and -$3.4 (see graph). Shift in Breeding Worth for AE enrolled sires. These are calculated using a five-year rolling average of the milk solids, volume charge and value component ratio. This rolling average includes three historic, one current and one forecast year. The value component ratio is used to partition the milksolids price into a value for milk fat and a value for milk protein. Liveweight differences in cows can affect their maintenance requirements, feed costs, value as a cull cow and the value of their calves. Differences in somatic cell count (SCC) can have a significant economic effect. mastitis treatment costs - low SCC cows have fewer cases of clinical mastitis. The economic value for fertility includes value gained through increased survival and value gained through earlier calving dates (i.e. longer lactations). herd calving distribution - cows with strong fertility contribute a much tighter pattern of calving across the herd, and they themselves generally have longer lactations. This value is offset slightly by the cost of increased feed demand in early spring. The economic value for residual survival recognises that animals with better longevity will reduce the requirement for replacement heifers. The economic value for BCS represents the improved profitability of an animal that can maintain body condition over her lactation. Our National Breeding Objective (NBO) in New Zealand is to breed dairy cows that are able to efficiently convert feed into profit. Breeding Worth (BW) is the index that we use to rank cows and bulls according to their ability to meet this objective.